When I first moved to Los Angeles in my twenties, I met a lot of thirty-somethings to forty-anythings who dolled out their various bits and pieces of wisdom, whether I wanted them or not it seemed. From life hacks to party tricks, inspirational pep-talks, moving monologues and transformational wisdom – I began to understand that all the learning I did while I was in college was child’s play compared to what the real world was actively teaching me. Don’t drink the tap water; make sure a friend has a spare key; find a rent controlled apartment; art is everywhere; you don’t have to be happy to smile; sleep later, have fun now; kindness goes a long way; things get better the older you are. Some lessons were more like sprints, easier to digest and put into motion immediately, while others felt like a marathon where I was taught lessons over an extended period of time after many an experience. As I gracefully bowed out of my twenties and into my thirties, I felt the wheels inside me churning – I was evolving and surely wasn’t that same girl that moved Koreatown so bright eyed and ponytailed in the Summer of 2018. As I’ve said before, you never stop having growing pains – it’s simply at some point they become psychological, emotional and mental growth over the physical; and that’s precisely where I’m at today. One of the many things that’s gotten better the older I’ve been, is my perspective on art, or at least my willingness to be curiously critical of it. 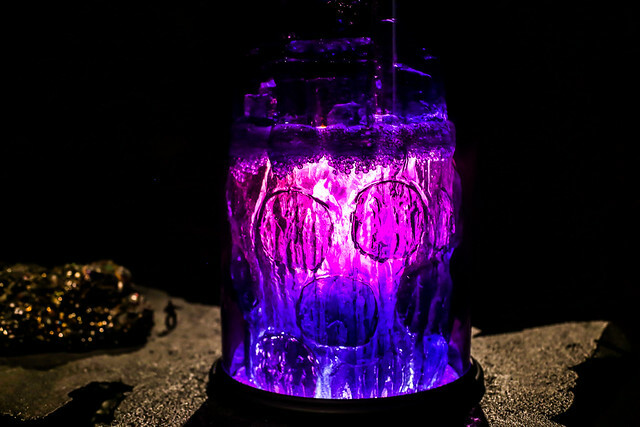 Immersive art, contained art, art in frames, urban street art in the wild – whatever the form, wherever it is: I will find it, and I will let it consume me. 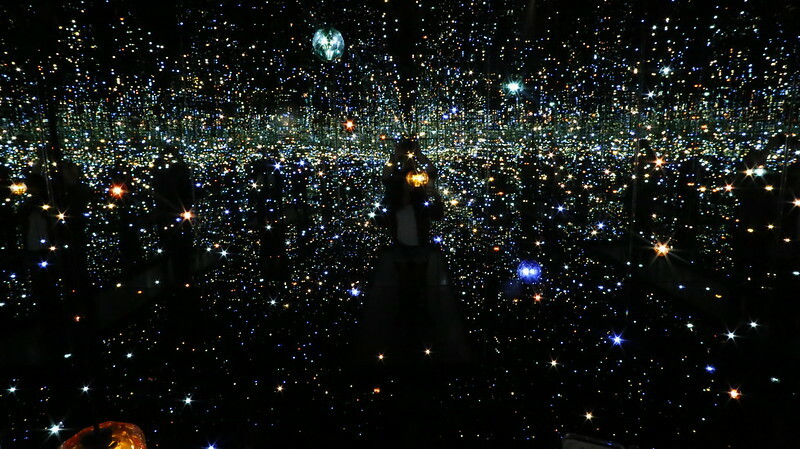 Recently, I’ve taken a bit of an obsession in visiting all of the museums and art galleries around Los Angeles. So far, I’ve crossed off quite a few – with the grounds of the Getty Villa and Getty topping my favorite architecture, the Natural History Museum piquing the nerd interest inside and while the LACMA and The Broad offer fantastic contemporary art. 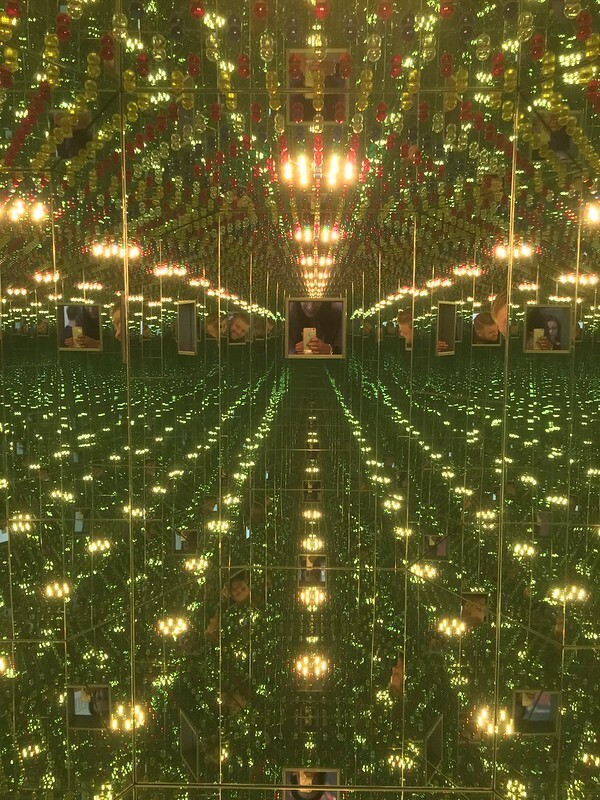 I still need to get to the Annenberg Space for Photography in Culver City and Neon Museum in Glendale, but for the most part – I’ve been able to cross quite a few off my list; meaning it’s time to hit the art galleries! Just the other month I ventured to an art opening at the Gabba Gallery but just last month I hit the mecca, the motherload, and my new favorite haunt: Hauser and Wirth’s Downtown Gallery. Taking over the space of an old flour mill in the heart of DTLA’s arts district is latest iteration of Zurich’s acclaimed Hauser + Wirth Gallery. The gallery curators themselves have a bevvy of locations under their belt, including London, New York, Hong Kong and Gstaa. 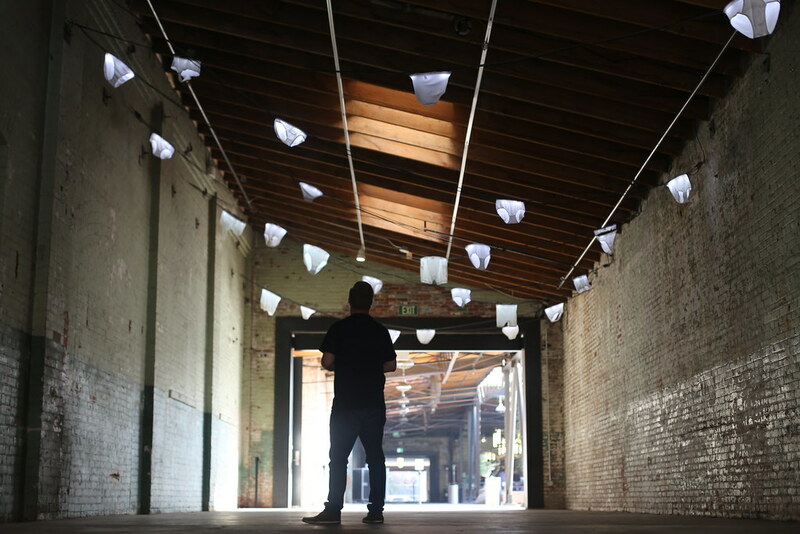 The Los Angeles edition opened their doors in March of 2016 in a sprawling urban that spans over 100,000 square feet between their multiple indoor facilities and large open air spaces. A one of a kind experience with no other facilities quite like it in America, Hauser + Wirth is made up of an open air atrium with outdoor sculptures, an education lab, a research area, a mind bending bookstore, a wonderful planting garden complete with beautiful chickens, and last but certainly not least, Manuela – an impeccable modern American restaurant. 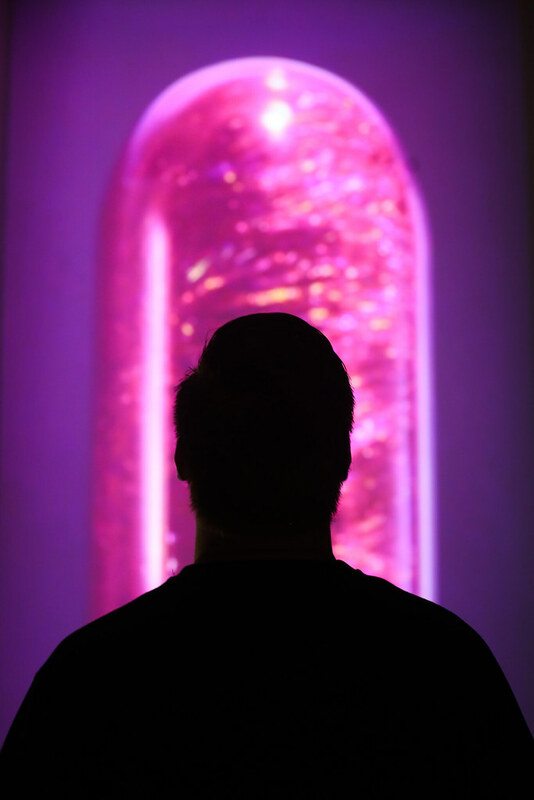 Of the exhibits open at the time, we wandered our way through various nooks and crannies, eventually we ended up at Mike Kelley’s ‘Kandors‘ and took the time to slowly saunter through his keen retrospective of both the world and psyche of Superman. For more on the Los Angeles Edition of the Hauser + Wirth Galleries, head to their website and socials; or if you’re in the Southern California area, simply pay them a visit in the heart of DTLA. My last few years in Los Angeles have elicited a mountain of personal growth and emotional change. In a grand sense, I’ve finally discovered myself and understand my innate needs and wants – and in the most basic, I’ve fully enjoyed being myself within each and every moment. 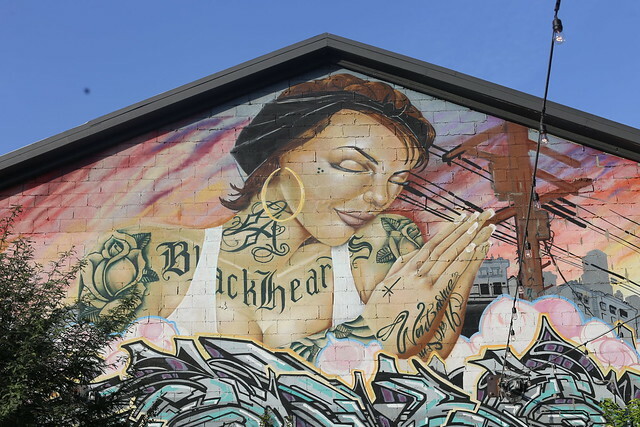 Forever a city kitty by nurture, it turns out that I’m actually a little mountain lion by nature but the trick has been learning what keeps my soul level and balanced – a little bit of sunshine and landscapes here, some graffiti, city lights, music and art there. The most amazing thing about living in Southern California, and especially Los Angeles, is the immediate access to both – sometimes even in the same day. 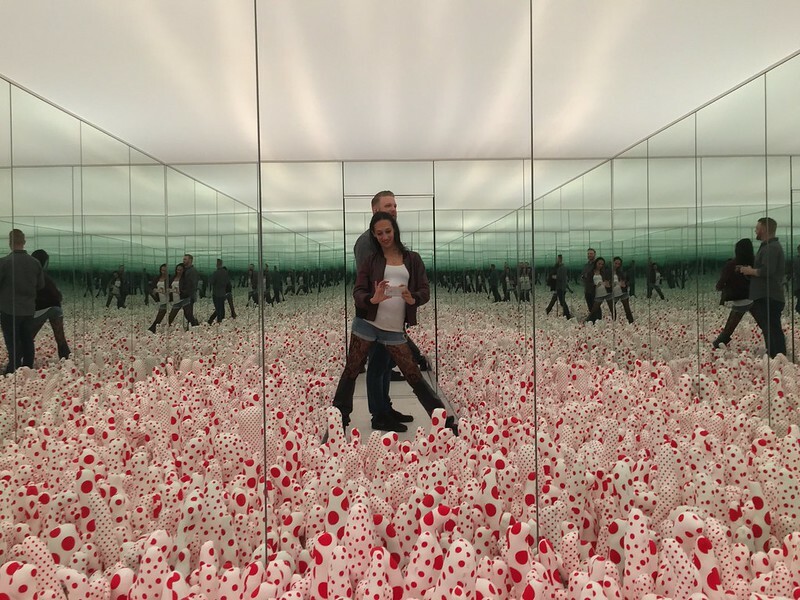 Just the other weekend, Danny and I took a cruise through the Angeles Crest Forest and grounded ourselves in the scenic beauty and amazing views, and this weekend we balanced it with now my favorite art exhibit I’ve ever been to – Yayoi Kusama’s Infinity Mirrors at The Broad. Art does a lot of things for me, but above all it provides me a new, askew and different lens to observe the world through. 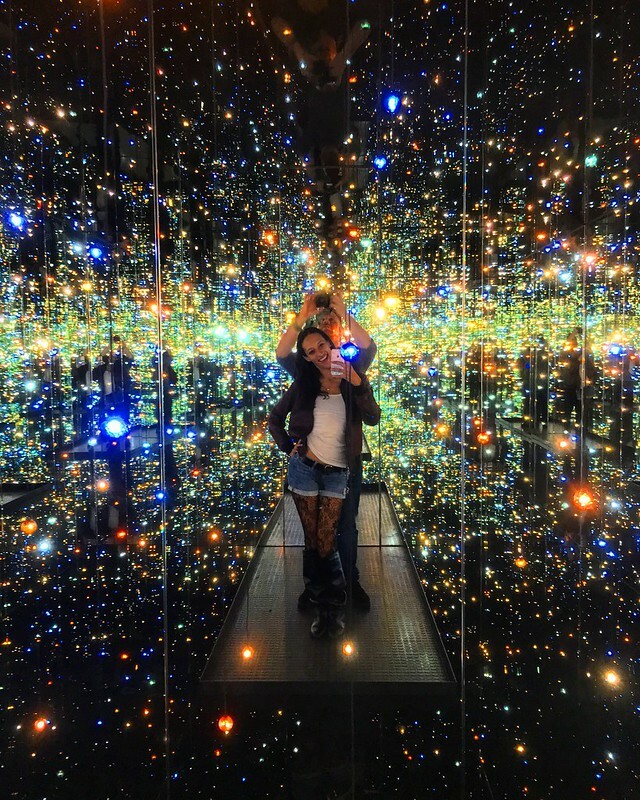 Whether it’s sculpture, watercolors, immersive art or sculptures – the best art forces me outside of myself to view the world from a birds eye view while diving further inside of myself in personal discovery; and I would absolutely include the Infinity Mirrors in that category. 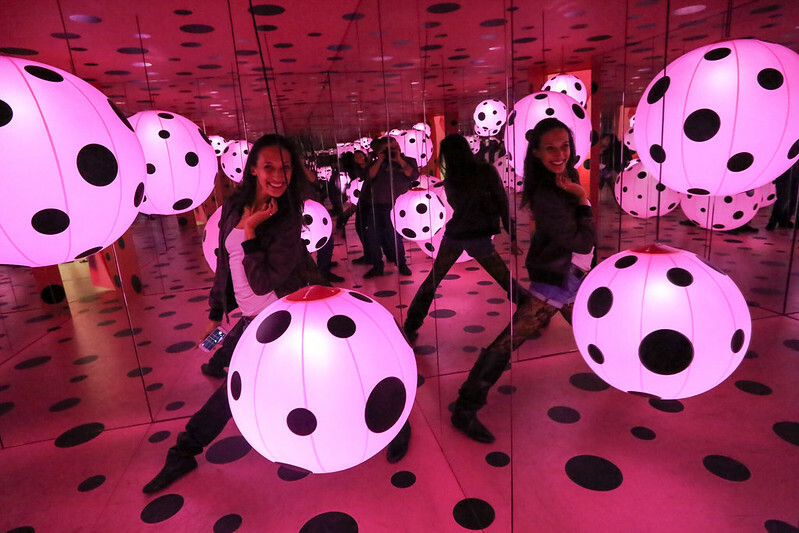 A playful experience with color and perspective, Yayoi Kusama’s excellent creative eye has created a handful of unique environments that meld your minds and opens your eyes to a vibrant, multidimensional universe. Hailing from Nagano, Japan, Yayoi began playing with color and shapes when she was ten and it’s obvious that her love and creativity have only grown exponentially since. Considered a forerunner to the Pop Art movement that cultivated Roy Lichtenstein and Andy Warhol, Yayoi calls her unique process “Self Obliteration”. An artist that’s as multidimensional as her work, Yayoi has foraryed from painting and watercolors to writing novels and poems, dabbling in fashion design and film direction. 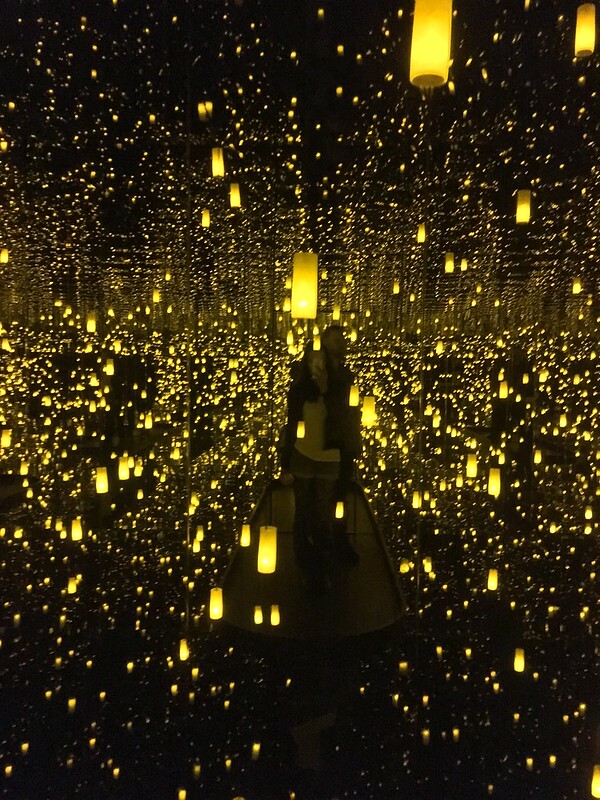 Since 1963, she’s been recognized for her hypnotic and mesmerizing Mirror / Infinity Room environments. 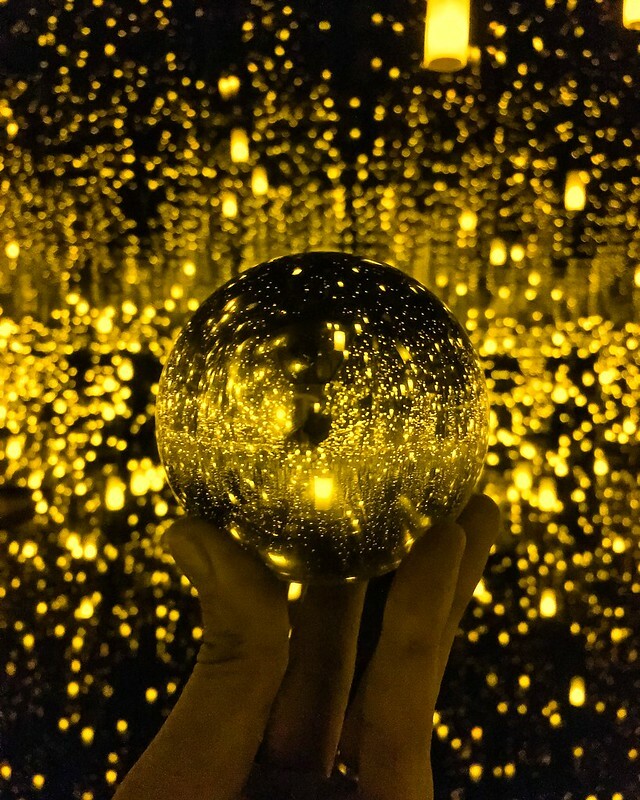 Featured at international museums as both a traveling and permanent exhibit, fans will be excited to know that the Yayoi Kusama has officially opened in Tokyo, Japan – if you’re up for the adventure. For now, Yayoi’s current works are being featured in a 50 year retrospective that’s on rotation between several museums across the United States. 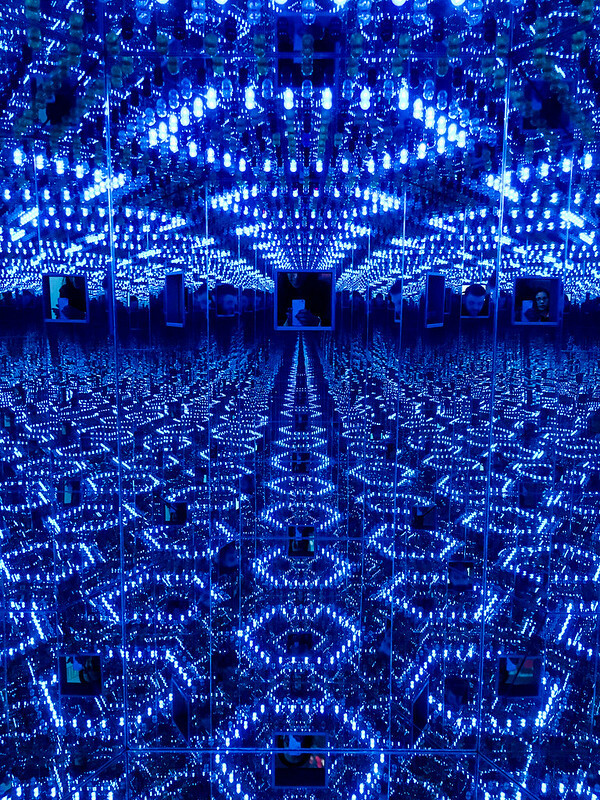 Originally at Washington DC’s Smithsonian Hirshhorn Museum + Sculpture Garden, the exhibit then traveled to the Seattle Art Museum over the Summer before landing at Los Angeles’s Broad Museum. In March, Yayoi’s works will travel to the Art Gallery of Ontario and then finally land at the Cleveland Museum of Art in July of 2018. For me, this was an experience I absolutely had to document – from room to room, I was moved phenomenally and entranced by my surroundings. 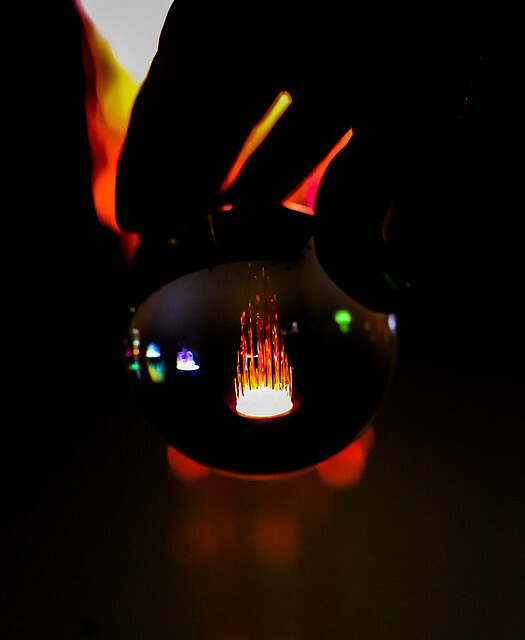 But, I also put my phone down and just was wowed by it all – and I highly suggest both for you, too. 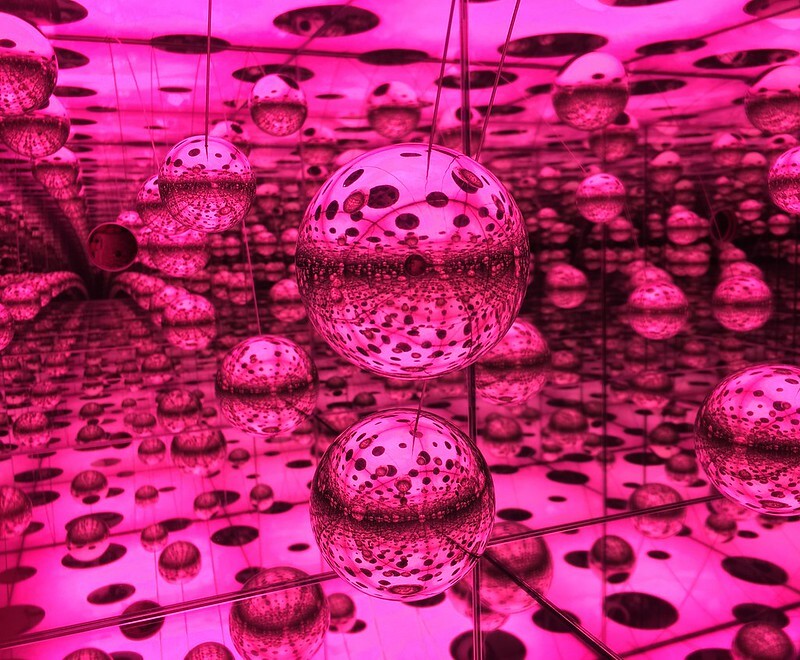 Due to a high volume of interest there are no more reserved spots for the Infinity Mirrors – but the Broad Museum does offer standby tickets for those willing to wait.